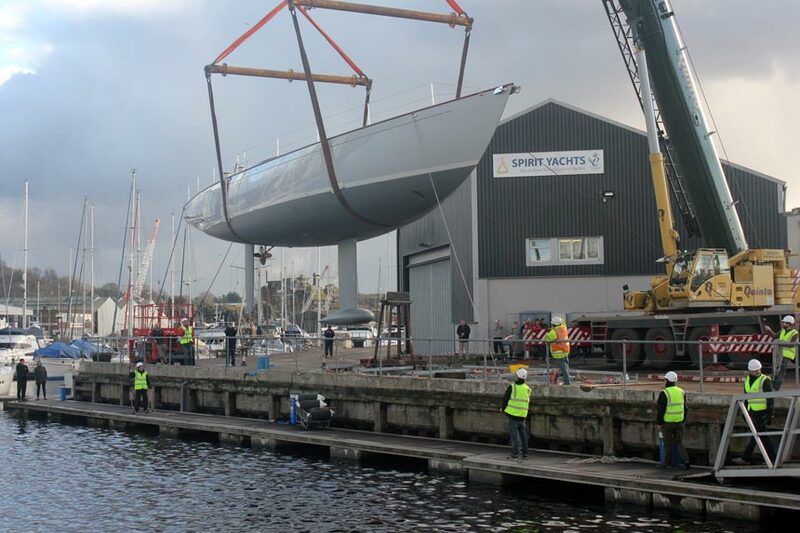 Following an integrated design and build process, the launch of the innovative new Spirit 65’ has arrived. Read on for first look images and details on her upcoming journey to Singapore. Earlier this month the new Spirit 65’ Chloe Giselle emerged from the hive of activity in the Spirit yard and into the Suffolk sunlight for the first time. Once outside the yard, the Spirit team fitted her keel and whilst the sealant was left to go off they went to work on her rudder, steering gear and final interior touches. On 6th February the eye-catching Chloe Giselle was launched into the marina at our base in Ipswich, in front of a crowd of spectators as well as her new owners. Following engine trials she will be shipped to Singapore, where four members of the Spirit team and trusted partner John Parker from One Sails will fly out to be on hand to personally step her mast and sails. Once she has been fully checked, Chloe Giselle will go on display at the Singapore Yacht Show from 23rd – 26th April, please see below for contact details if you would like to book a private viewing. The new 65’ is designed as a performance orientated sailing sloop to combine classical elegance with lightweight construction, excellent engineering, the finest equipment and a superbly fitted interior. Offering a balanced blend of style and practicality, she sports clean, elegant lines, yet is spacious and comfortable down below. With plenty of room to relax on deck, two roomy guest cabins aft and a luxurious owner’s cabin forward (all of which have air conditioning), the Spirit 65’ is not only aesthetically beautiful, she offers endless opportunities for blue water cruising with family and friends as well as regatta racing. The beauty of the 65’ is evident in her mahogany cockpit and integrated fan style skylight over the forward end of the coachroof, also in mahogany, allowing maximum natural light into her large saloon below. With high modulus carbon fibre spars and ECsix standing rigging from Southern Spars, Dyneema and Vectran running rigging and Lewmar winches, the Spirit 65’ has been meticulously designed and built to perform on the racing scene without making blue water cruising unnecessarily complicated. The Spirit 65’ will launch on Pontoon C1 at the Singapore Yacht Show (23rd – 26th April). For more details or to arrange a private viewing at the show, please email [email protected].